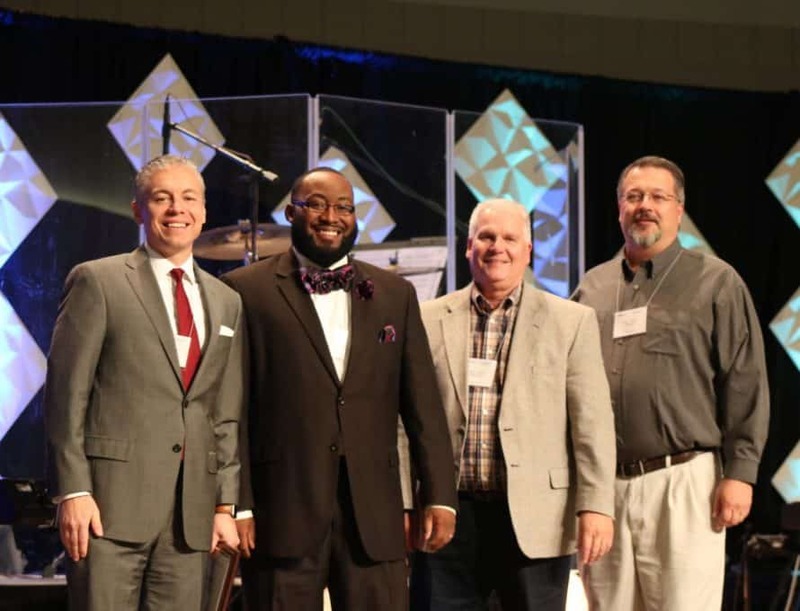 SPRINGFIELD – New Missouri Baptist Convention officers include: President Jeremy Muniz, pastor of First Baptist, De Soto, who previously served as First Vice President; First Vice President Jon Nelson, pastor, Soma Community Church, Jefferson City; Second Vice President Jeff Anderson, pastor of Calvary Baptist Church, Hannibal, and president of the 2018 Pastors’ Conference; and Recording Secretary Chad Hodges, pastor of First Baptist Church, Wright City. SPRINGFIELD — Jeremy Muniz, pastor of First Baptist Church, De Soto, was elected president of the Missouri Baptist Convention, Oct. 23, at Crossway Baptist Church. Muniz, who has been serving as first vice president of the convention, was nominated by Pastor Joe Costephens of First Baptist Church, Ferguson. Also running was Ron Crow, pastor of First Baptist Church, Diamond, who was nominated by Pastor Eddie Bumpers of the Crossway Church. When messengers cast their ballots, Muniz garnered 54 percent of the vote, compared to Crow’s 44 percent. Two percent of the ballots were not marked correctly and were disqualified by the teller committee. Other officer elections were unopposed, and the convention recording secretary (Rick Biesiadecki, transitional pastor of Calvary Baptist Church, Columbia) cast the convention ballot to elect the candidates by acclamation. The first vice president position will be held by Pastor Jon Nelson of Soma Community Church, Jefferson City. He was nominated by Pastor Monte Shinkle, Concord Baptist Church, Jefferson City. Jeff Anderson, pastor of Calvary Baptist Church, Hannibal, was elected second vice president. He was nominated by Pastor Ted Middleton, of First Baptist Church, Lewistown. The recording secretary position will be filled by Pastor Chad Hodges, First Baptist Church, Wright City, who was nominated by his director of missions, Brent Campbell, of the Twin Rivers Baptist Association. Outgoing president, Ken Parker, of the First Baptist Church, Kearney, thanked the current slate of officers for their service. Those included: 1st vice president, Muniz; Tim Smith, co-pastor of Aurora Springs Baptist Church, Eldon, and recording secretary Biesiadecki. Parker welcomed the new officers at the close of the convention and presented the gavel to President Muniz.